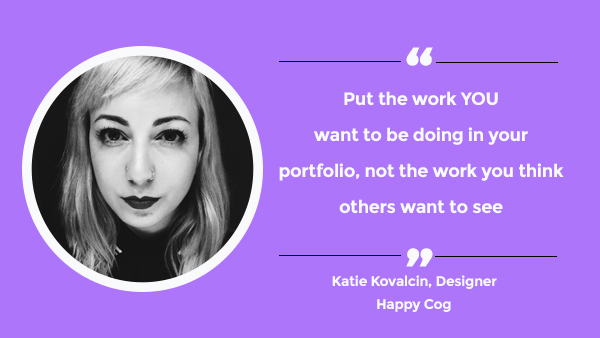 Katie Kovalcin is a web designer at Happy Cog in their Austin office. She previously worked in Cincinnati, Ohio both independently on branding work with startups, and at an agency doing larger brand work. She loves identity and print design, but recently fell head over heels in love with the web. We chatted with Katie about all things web design and portfolio. I did a lot of photography in high school and wanted to be a fashion photographer. I decided to go to art school for that. When we declared our majors at the end of freshman year, I (on a whim) checked the box for Advertising & Graphic Design instead. While our program was super old school and advertising focused, I did learn how to tame the Creative Suite beasts and the advertising and copywriting aspect forced me to think conceptually and not just “something that looks cool” like I so badly wanted to be creating at the time. 2. Tell us about how you learned the skills you use most frequently in your current role. Being thrown to the wolves! Not really that extreme, but it was just by trying it. I befriended the developers at my first job and picked their brains a lot. When some of them left to form startups, they needed a designer and I wanted web experience. They would tell me when my designs were irrational for the web, but since we were all creating something new it was okay for us all to be on a learning curve. Now, being at Happy Cog, I have learned a ton about web standards and I keep learning new things every day. 3. Do you think designers should learn to code? Why? Why not? If you would have asked me this six months ago, I would have said, “No way!”—I was stubbornly an advocate for designers designing and developers coding. I never saw the value because I always worked with great developers who would have done it way better and faster than I could have. However, now I sing a different tune. I can see the value in designers learning to code, just not in the way that I originally thought we “needed” to learn. I thought when people argued for designers learning to code it meant “build the whole damn website yourself”, but now I see that we can learn low-fidelity code to our advantage. 4. How did you go about teaching yourself code? As I mentioned before, it was just recently that I have been learning so I still have a long way to go! Since I have been learning at work for the HTML wireframe prototypes, I started with the HTML Prototyping video in the Happy Cog Way series to get setup. From there it’s been a lot of asking questions and getting help from coworkers. Reading Foundation’s documentation, taking some classes, just trying to build new things and attempting to make them work! Lots of Googling. Knowing that people want you to succeed. College was so competitive: the grades, the internships, the jobs after graduation. I thought that the design industry was just cutthroat. And while it is competitive, in the sense that competition drives us to be better, the little secret that people told me is that people are actually rooting for you! Once I learned this, it gave me the confidence to reach out to people. They won’t make fun of you because you know less than them, they’ll help you be better. 6. 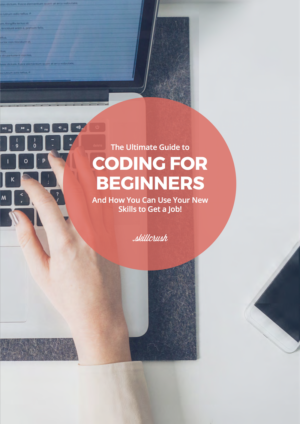 What advice would you give to someone just getting started learning to code or design? Ask for help. Ask for critiques. You won’t learn it all yourself, and learning in a vacuum won’t make you any stronger or better. Other people’s perspectives are invaluable to your work. 7. Lots of people create portfolios but have no idea what to put in them – what advice would you give to those just starting out or with very little experience? Put the work you want to be doing in your portfolio, not the work you think other people want to see (like “oh, I think that this project that I hate the design of was a really good concept”). Don’t put in work that you aren’t proud of and excited by. Make up fake projects for fake clients if you have to. If you make fake projects, the trick is to make it look real. Put it in context: print it out and photograph it, mock it up however you need to as if it were really a finished product and not just comps/ideas. 8. What tips do you have for up and coming designers looking to connect and network with other designers and developers? Reach out to them! Like I mentioned above, 9 times out of 10 people are absolutely more than willing to help you, if you just ask. Just be nice and approachable and not like you want something from them. I used to email people and ask them to take a look at my portfolio and give me advice. Meet them at a coffee shop, buy them a latte for 30 minutes of their time. It’s non-threatening because you aren’t seeking a job from them, but they’ll remember you when they do look to hire. I was never any good at networking at meetups, so I like the more one-on-one settings of personally reaching out to people. 9. What’s your personal motto/mantra? This is really cheesy, I think I read it on a fortune cookie or (more likely) some other design article. But one idea’s that’s stuck with me is a (supposed) ancient Chinese proverb that you get 3 chances in life. If you take one of those 3 chances, you get 3 more chances. Etc. Etc. While I don’t wholeheartedly believe in these sorts of metaphors, I do 100% believe that the more opportunities or risks you take, the more opportunities that will happen because of it.